Always use the redraw regions option when building your project. 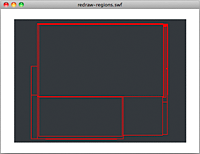 To improve rendering, it’s important to use the redraw regions option when building your project. Using this option allows you to see the regions that Flash Player is rendering and processing. You can enable this option by selecting Show Redraw Regions in the context menu of the debug version of Flash Player. 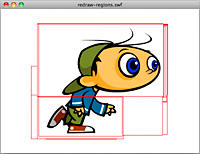 In Adobe AIR applications, this method is the only way to enable the redraw regions option. To improve performance, set the visible property of the hidden running character to false or remove it from the display list altogether. You should also stop its timeline. These steps ensure that the display object is frozen and uses minimal CPU power. Remember to use the redraw regions option during the whole development cycle. Using this option prevents you from being surprised at the end of the project by unnecessary redraw regions and optimization areas that have been missed.